Please note that this is a 1 year subscription to Adobe Creative Cloud for ETLA. If you are renewing a subscription, please use a NEW Adobe ID to redeem your code and gain access to Creative Cloud with 100GB of storage. An Adobe® Creative Cloud™ Student and Teacher Edition membership gives you access to all the latest and greatest Adobe creative tools, plus online services* and other new apps as they’re released. For a low price – highly discounted for education – you get the freedom to create anything you can imagine. What's Included in Creative Cloud? An Adobe® Creative Cloud™ membership gives you access to every Adobe Creative Suite® desktop application and more. One simple membership gives you access to every Adobe Creative Cloud desktop application, plus online services* and other new apps† as they’re released, giving you the freedom to create anything from posters, to apps, to websites and more! Use cloud-based storage and device-syncing capabilities to access your work on multiple devices and share files with classmates and professors or teachers. Publish your personal website or electronic publication to give your portfolio or resume the upper hand. Stay current with an affordable membership ‐ highly discounted for education ‐ that includes upgrades to all new versions upon release, plus new features and services between releases, because the way you create and share is always changing, and your creative tools should keep up. †Mobile and tablet applications require a separate download and agreement to additional terms. Such applications may not be available in all countries or languages and may be subject to change or discontinuation without notice. Additional fees or subscription charges may apply. Adobe® Creative Cloud™Desktop Applications for ETLA provides access to all Adobe creative tools for download and installation on your local computer. 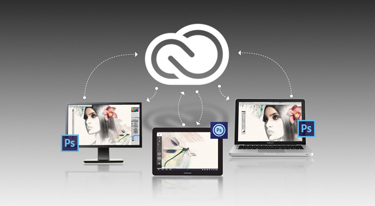 Creative Cloud is compatible with both Mac OS and Windows® platforms. Go to www.adobe.com/go/cc_techspecs for more information.